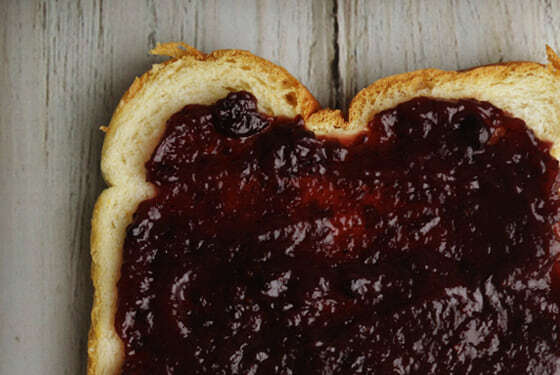 Need a simple snack that you can make out of real food at home? 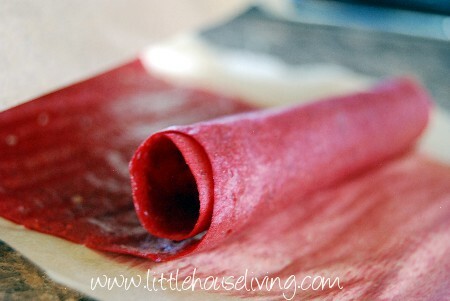 Homemade Fruit Roll Ups are so much easier to make than you can imagine! You only need a few things to put them together. Everyone loves a good fruit snack or fruit roll up right? Unfortunately, those “fruit” roll-ups from the store actually have very little fruit in them unless you count corn syrup as a fruit. Lucky for us they are super easy to make! I’ve also heard that you can make them in the oven if your oven temp can go very low, but we just use our dehydrator. First, start by finding some fruit. Fresh or frozen fruit will do. I used strawberries in this tutorial. 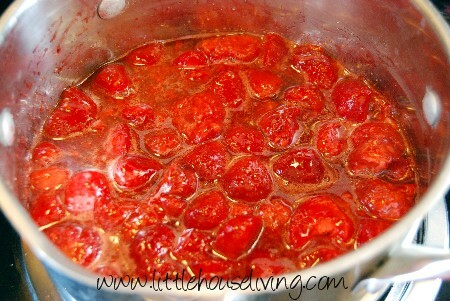 Add the strawberries or fruit to a stockpot and add in sweetener if .you feel like it needs it. (We do not add any) You can use honey or raw sugar if you’d like to add a sweetener. Cook the fruit on the stove and mash it will you go. Cook until all the fruit is like a chunky sauce. –Here are some Blueberry Gummies that you can make next! 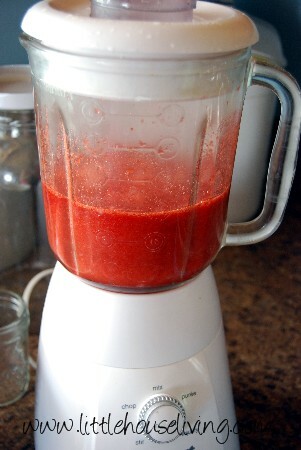 Then pour into the blender and pulse until smooth. Be careful, the mixture will be hot! For my homemade fruit roll ups, I added a banana into mine to make strawberry banana rolls. 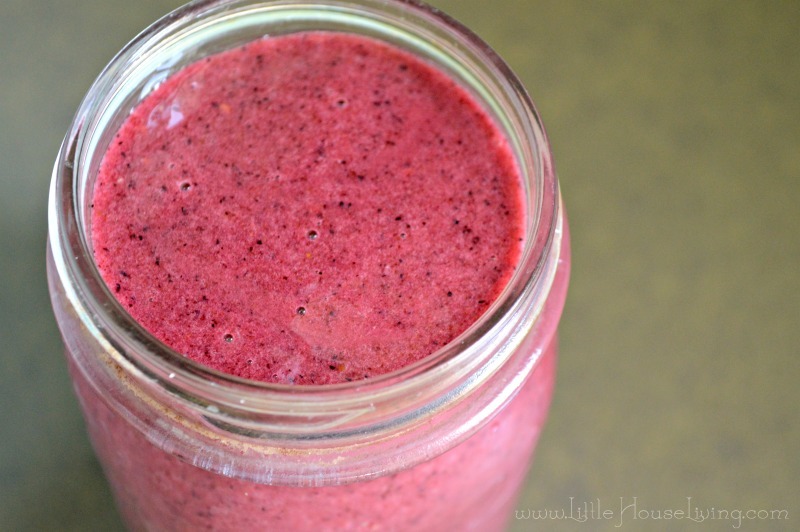 You can stick with whatever fruits you cooked down or can add more fruits at this point if they are easily pureed. You could even add veggies too. It’s a great way to “sneak” extra veggies into your kids’ diet! Some dehydrators come with fruit leather sheets. You can use these or just lay down parchment paper in your machine. I used unbleached parchment paper from If You Care. Turn your dehydrator to 125F and dry the fruit for at least 6 to 8 hours depending on thickness. When it’s finished it should no longer be sticky or have sticky spots in it. 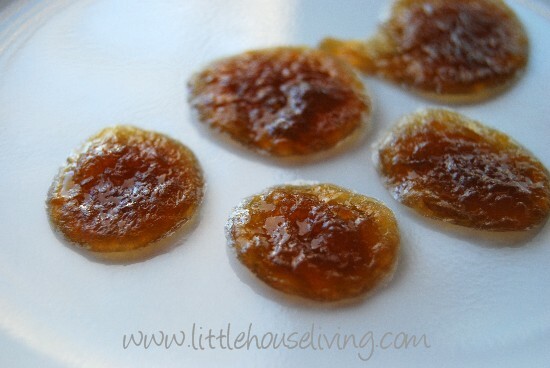 –These Strawberry Orange Gummies are so good too! 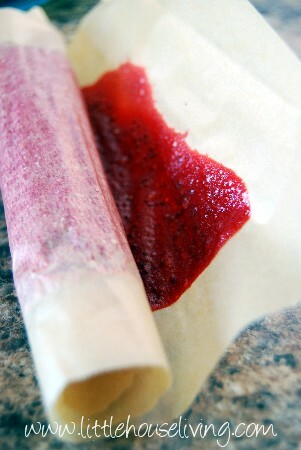 The roll ups are done when they are no longer sticky but still remain pliable. Roll them up to store. The nice thing about these is that you don’t need to refrigerate so they make a great road trip snack! In case you were wondering I have a L’Equip FilterPro Food Dehydrator and I just love it! It’s awesome for those of us with allergies because it actually has an air purifier in it so it filters all the air it draws in to dry your food. Plus it’s super quiet, sometimes I forget it’s running! 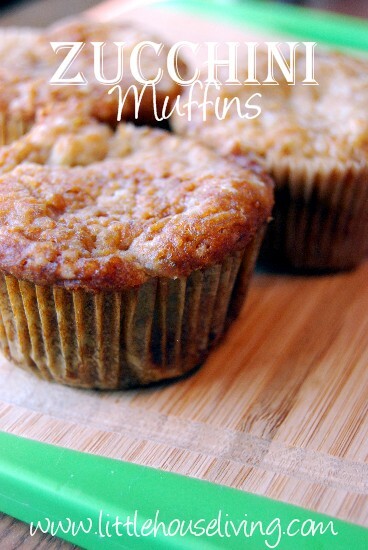 —Here are some more Frugal Healthy Snack Ideas that you might enjoy making! 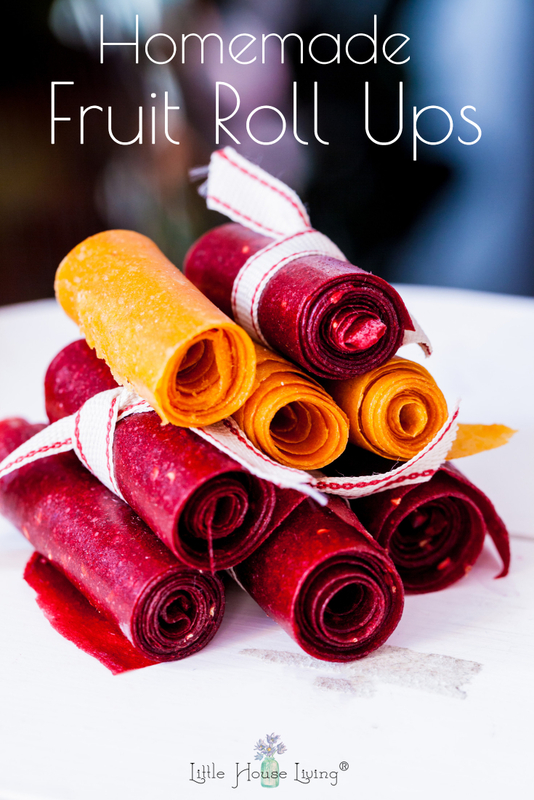 Have you ever made Homemade Fruit Rolls Ups? What flavors does your family like? 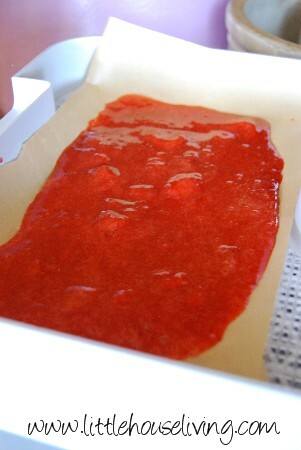 This blog post for Homemade Fruit Roll Ups was originally posted on Little House Living in July 2010. It has been updated as of January 2019. Thanks for posting this!! Can I use the applesauce that you buy from the store? Thanks in advance!!! I have a nice dehydrator, but it’s hardly ever been used. This year I want to make fruit rollups…can I puree peaches, strawberries, pears and cherries (separately) and put them in the dehydrator? Does it take days or hours to dry them to the right consistency? Would it be all right to sprinkle a little sugar on top of the puree, and what about sprinkling a little Splenda over the fruit? I always put sugar on my fruit when I eat it from a bowl so that sounds good to me. Also, which of the above fruits taste the best as just dried pieces? 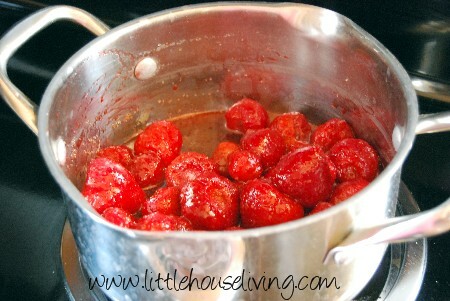 Strawberries, pears, and cherries all taste good as puree and dried pieces. It takes one good long day to make fruit rollups, maybe a little shorter if you spread the puree thinner. I would add sugar to the puree mixture rather than on the top so they aren’t crunchy, I’m not sure about the Splenda…we’ve never used a substitute. Hope that helps! I have made fruit rollups for years. I take 1 cup of honey to 2 cups fruit. The honey acts as a preservative ( although at our house I can’t keep up with demand) and you can use any fruit. Can you use your oven to dehydrate them? I don’t have a dehydrator. Yes you can, just set your oven at the lowest possible temp it will go and watch them carefully. how long do these keep stored? I have one child so our food goes a long way! Any concerns with growing mold if kept longer than a couple weeks?